Lyfta's effective blend invigorates your mind and metabolism to liberate you from bad eating habits, and keeps you focused on what's most important. Find satisfaction in this stress-reducing, mood-enhancing supplement. 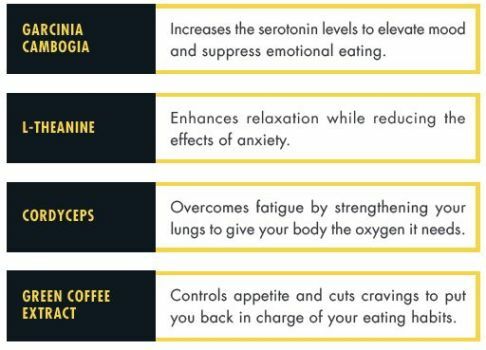 Lyfta improves your focus and your emotional well-being by raising your serotonin levels giving you confidence and increasing your productivity so you can conquer your top priorities with ease. Portion management is a key element in maintaining a healthy weight. Lyfta helps you ditch comfort foods while controlling your appetite so you can adjust to sensible portion sizes and make healthier eating choices. Manages stress - Ditch comfort foods and find satisfaction as Lyfta normalizes your body's stress response. 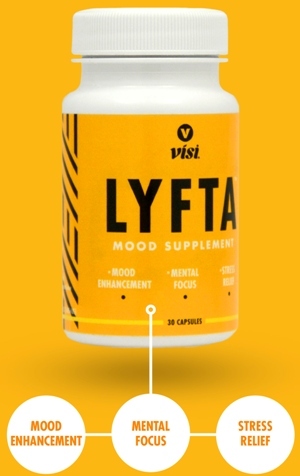 Enhances mental clarity and focus - Lyfta improves your focus so you can conquer your top priorities with ease. Naturally controls appetite - Lyfta's blend of wholesome ingredients manages appetite and cravings so you can skip unhealthy snacking, adjust to sensible portion sizes and reduce caloric intake. Garcinia Cambogia - Garcinia cambogia is a fruit native to Indonesia, and is well-known for blocking fat by inhibiting a key enzyme called citrate lyase, which is used to convert carbohydrates into fat. Without citrate lyase, the fat-making process stops and the production of unhealthy cholesterol and triglycerides decrease. Garcinia cambogia also raises serotonin levels to elevate mood and suppress emotional eating. L-theanine - Derived from green tea, L-theanine is known for its ability to enhance relaxation while reducing the effects of anxiety on cardiovascular health. L-theanine has also been shown to increase nitric oxide production to support cardiovascular health and maintain healthy blood pressure levels. Cordyceps - Traditionally used in Chinese medicine, Cordyceps overcomes physical and mental fatigue by strengthening your lungs to fill your body with the oxygen it needs. Green Coffee Extract - Green coffee beans are unroasted coffee beans, containing naturally occurring caffeine and strong antioxidant properties to help cut through the fog that normally accompanies dieting. In randomized studies, they have also been found to reduce blood pressure and facilitate healthy weight loss. Green coffee extract controls appetite and cuts cravings to put you back in charge of your eating habits. A. Lyfta is the natural, herbal way to trim your stress and your appetite. Lyfta naturally controls hunger so you can make healthier eating choices. By reducing stress, Lyfta helps you manage your daily demands without needing to turn to comfort foods. Soon you'll be tackling your top priorities with ease as Lyfta helps you focus and enhances your mental clarity. Q. What is the recommended time to take Lyfta? A. Visi recommends one Lyfta capsule with breakfast and one capsule an hour before lunch. Q. What are the benefits of Lyfta? A. Lyfta increases serotonin levels in your brain to elevate mood and suppress emotional eating. Additionally, Lyfta supports appetite control and cuts cravings, and enhances relaxation while reducing effects of stress and anxiety. Q. What is the difference between Valla and Lyfta? 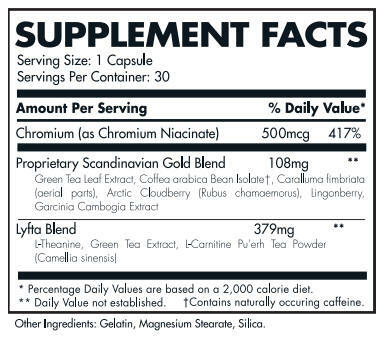 A. Lyfta is formulated to improve mood, provide mental clarity, and help in weight management. Valla is focused on increasing metabolism, creating thermogenesis, and giving you the energy you need to power through tough workouts so you can lose weight and gain muscle. Q. Is it safe to take Lyfta for an extended period of time? A. Yes, each ingredient is completely safe to take for an indefinite period of time. Q. At what age can someone start using Lyfta? A. Lyfta is formulated for adult (18+) use. Q. What are Lyfta's capsules made of? A. Lyfta uses gelatin capsules.